Earlier this year, we had the opportunity to preview the Shoei J-Cruise Helmet that will be released in Europe in 2013. We hope to see this model in the US market next year, but are awaiting official confirmation. While Shoei has produced 3/4 helmets in the past, the Shoei J-Cruise Helmet is a breath of fresh air after a short hiatus in this class. 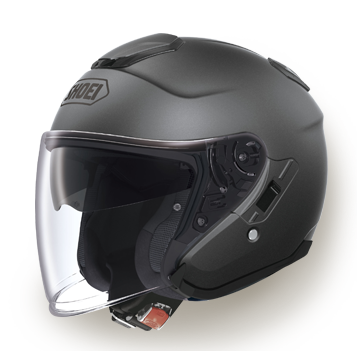 Borrowing technology from the Qwest and the Neotec, the J-Cruise has an optimal ventilation system as well as an interior drop-down sun-visor, which does not compromise shell integrity. Building with superior fit and finish, Shoei will also have a full range of cheek pads and center pads that are fully removable, washable, and interchangeable. As the name implies, and its predecessor confirms, the J-Cruise will be a popular choice for the American V-Twin crowd, however, the sleek lines and improved aerodynamics make it a viable option for city riders or even sport-touring. Stay tuned for updates on our product pages as we find out more about pricing and availability!